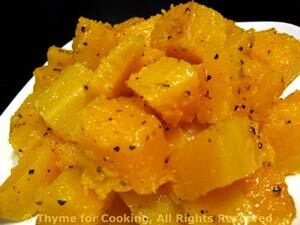 Butternut Squash with Browned Butter, Thyme for Cooking easy side dish. The salty Browned Butter is the perfect foil to the sweet squash. 12oz (360gr) butternut squash, about 1/3 average size squash. Put into a steamer basket over boiling water and steam for 10 - 15 minutes, or until tender. (Stick a fork in a piece). If you crowd your steamer it may take a few minutes longer. When done, remove, put into a serving dish and cover to keep warm. Drain the pan and return to medium heat. Add the butter and let it melt and brown, undisturbed. Watch carefully once it starts to brown, as it can burn very quickly. When brown, add pepper and salt if you like, and pour over the squash, using rubber spatula to scrape it all out. Serve.